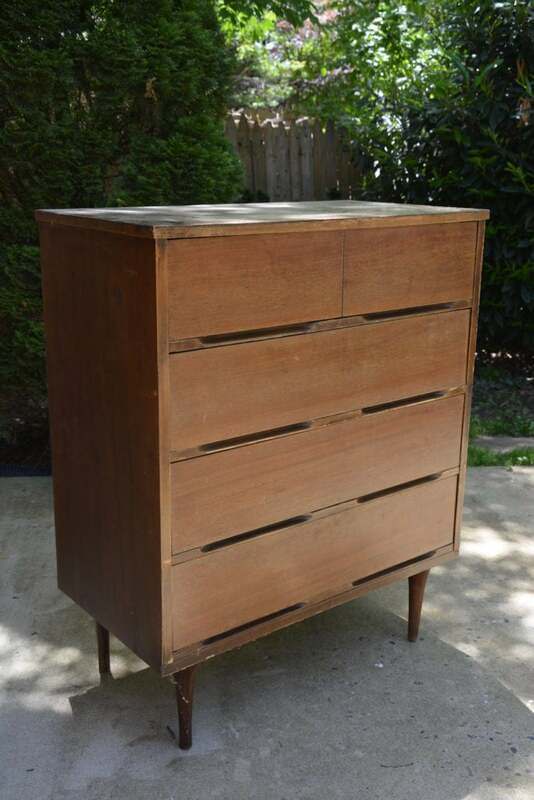 This is the tale of what I consider an epic mid-century modern dresser. Pull up a chair and a hot tea… This may take a while. 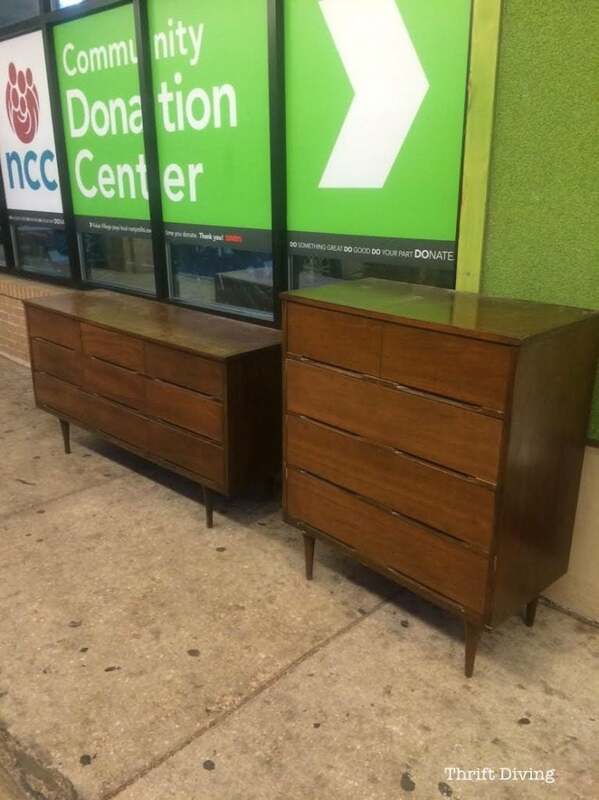 It’s quite funny now, thinking about how I had found these two mid-century modern dressers by total chance at the thrift store on a day when I was supposed to “be good” and just donate things to the thrift store and not buy stuff from the thrift store. (You can read all about how I found them here). But at $14.99 for the tall skinny guy and $24.99 for his short, fat friend, it was too good of a deal to pass up. Hard to believe such quality furniture was less than the cost of a 3-D movie and popcorn. But DIY is awesome, isn’t it? Especially when it’s a project that almost got the boot, but ended up so nice! And then you create this wonderful something…. 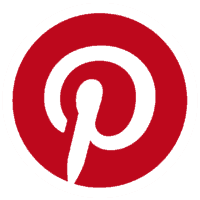 ….and your love of DIY amplifies. There Are Always Problems, Aren’t There? 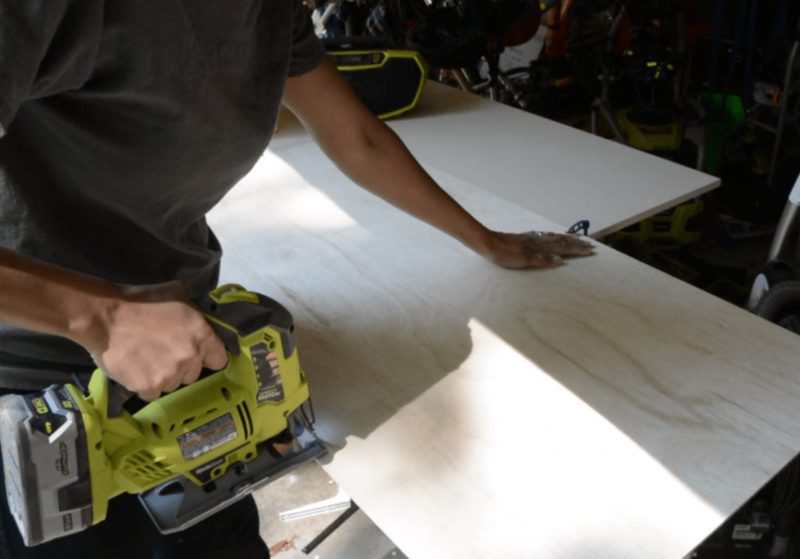 When working on furniture makeovers, wouldn’t it be great if they all turned out perfect and you could just marvel in your total DIY genius? But that’s not always the case, now, is it? I could deal with the badly marred top. I knew I could just sand that down and–problem solved. But what I couldn’t deal with was finding what appeared to be Roly Poly bug shells in the dresser. Then I detected a nasty “old wood” moldy smell inside. Despite ripping off the back (with the goal of replacing it) and cleaning the inside with vinegar and water, I just couldn’t get rid of the smell. Well, sometimes you don’t wait for a Strike 3. You just decide you’re done. 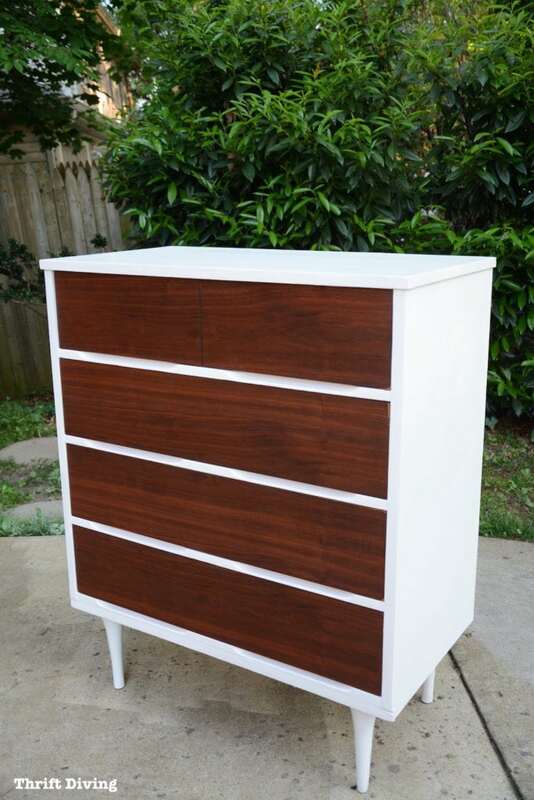 And that’s when I decided I would just re-donate this mid-century modern dresser back to the thrift store. Even The Salvation Army Wouldn’t Take It! The dresser was all packed up in the “Please Take My Junk” pile. But with a gaping hole in the back of the dresser, they passed right on over it. 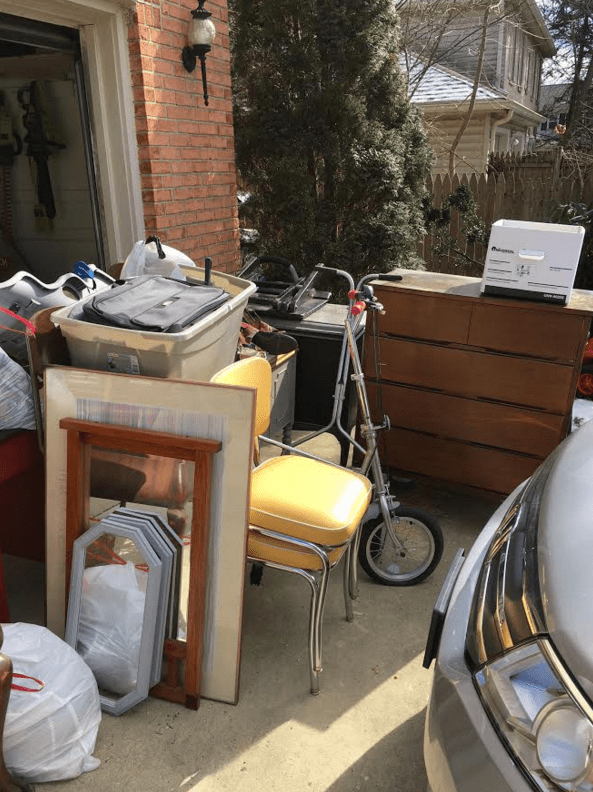 I came home after the pick-up and saw the dresser just sitting in front of my garage, left behind like a neglected stepchild. Instead of moving it inside, I let it sit. For well over a month. Rain fell on it…. snow sat on it for days…. I willed it to “die” and wither away so I wouldn’t have to think about hauling it back. But it stood there, sturdy and hearty as ever, begging for a makeover. Finally, I moved it inside of the garage. 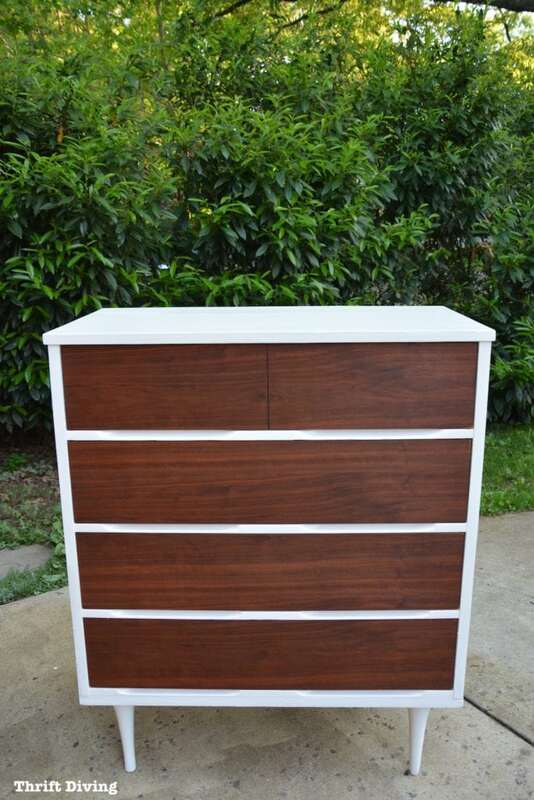 It was about that time that my cousin mentioned in passing on Facebook that she needed a dresser. 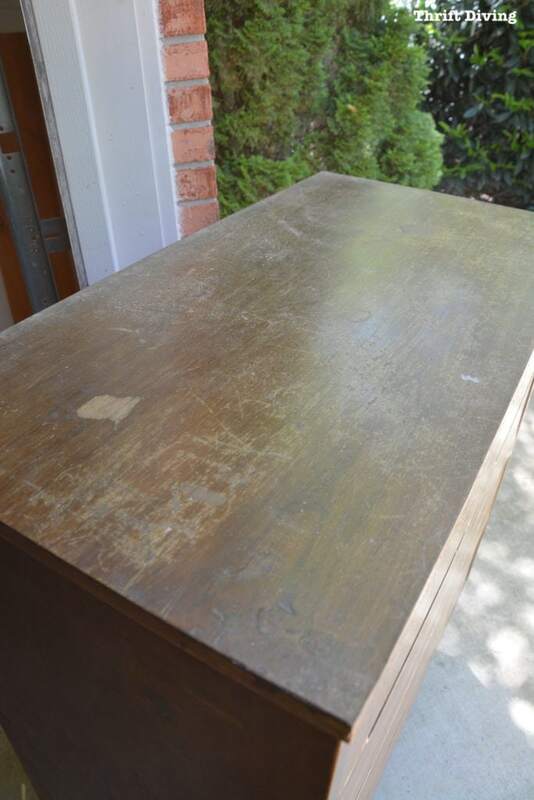 Hmmm….could this dresser actually be saved?? 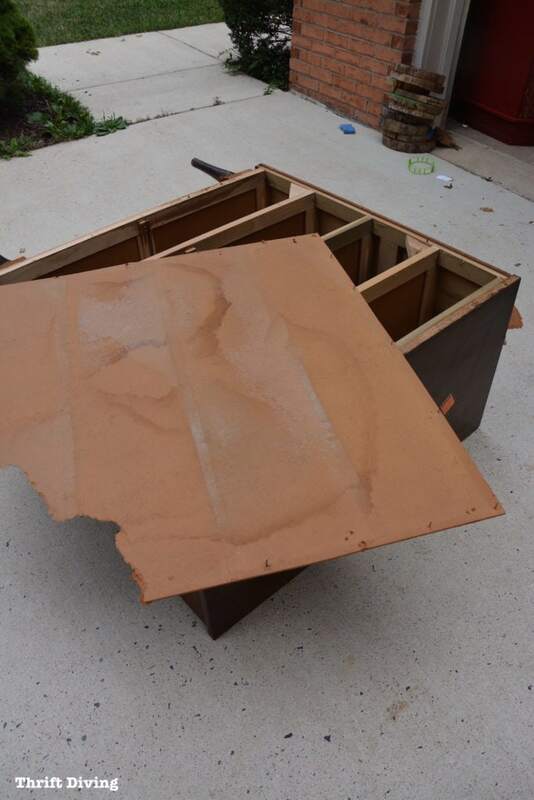 Couldn’t old Roly Poly shells be cleaned out, and could you paint or replace the old musty parts? It was worth finding out! 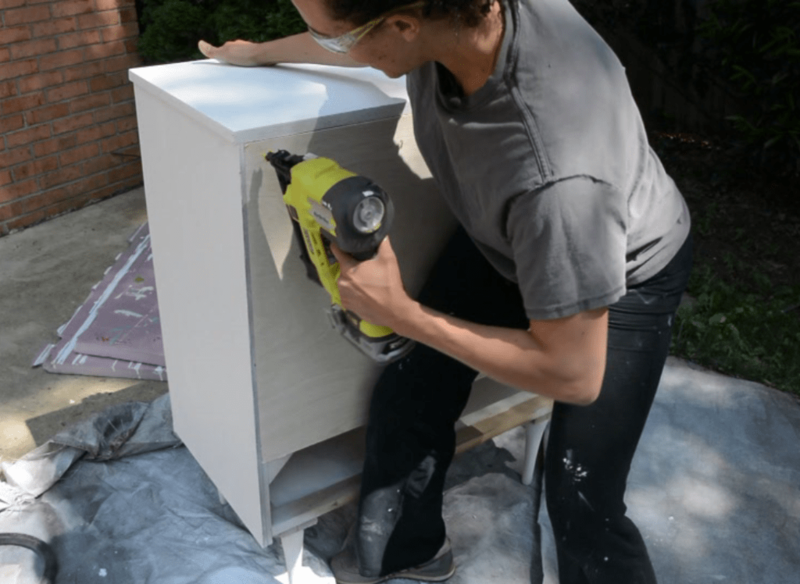 Most furniture paint….scratch that….all furniture paint brands will tell you that you don’t need to sand before priming. It actually depends on the piece. And this clearly needed sanding first. To even think of painting over this would have been a nightmare and it would have looked horrible. But you know me. I see potential in everything. And I knew once I made the commitment to transform it, it would be fabulous. As much as I love using chemical stripper (in an oddly satisfying way of scraping gunk), another part of me hates dealing with the mess. 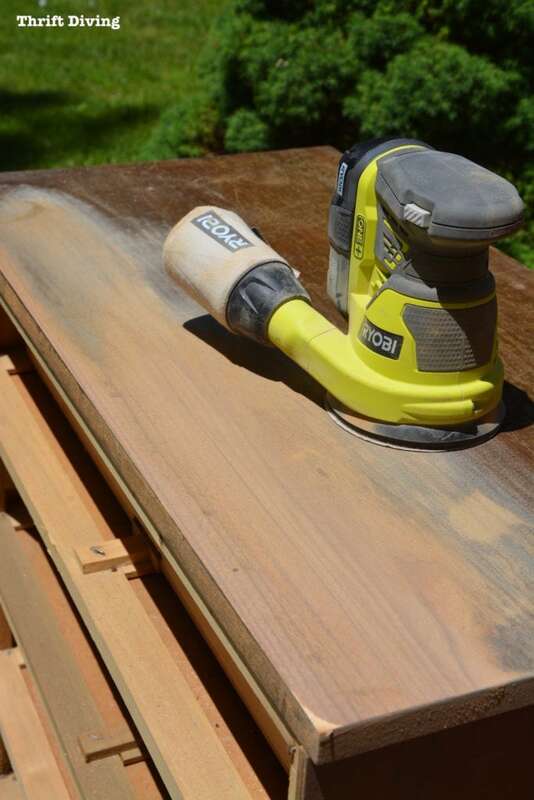 It’s easier for me to grab my orbit sander, throw on some 80-grit rough sand paper, and strip down the first layer, working my way from 80-grit to 150-grit (medium) to a fine 220-grit sandpaper. Doing this makes the wood soooo smooth and beautiful, keeping the “swirly marks” from an orbit sander much less visible. 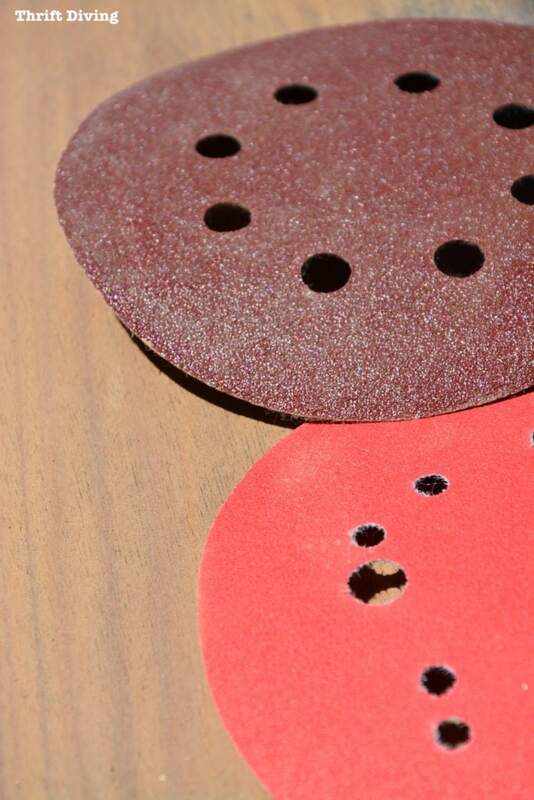 TIP: Always start with a rough sandpaper and work your way down to a very fine grit to finish it off. I only planned to sand the top since it was in bad condition. I didn’t really need to sand the sides. Once I was done, it looked great and ready for paint! It was chipped in the front, but nothing that I little wood filler couldn’t fix. 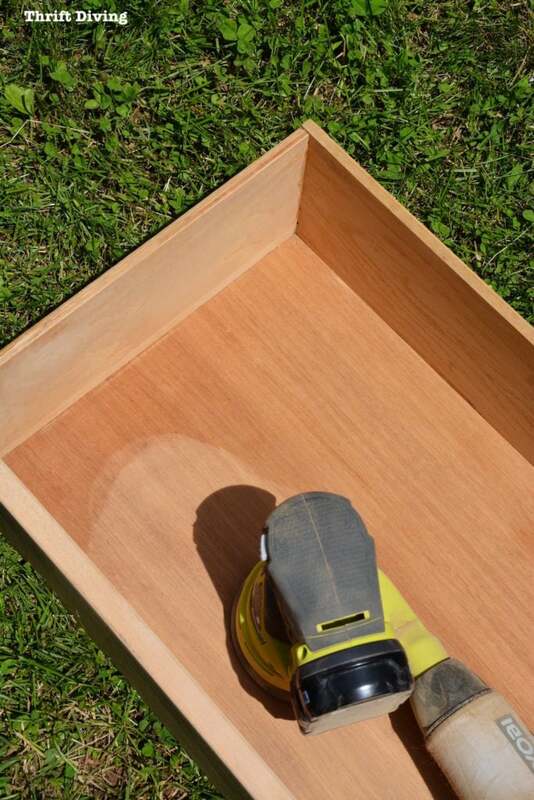 Have You Ever Sanded……the INSIDE of a Drawer?! I never had, either, until now. 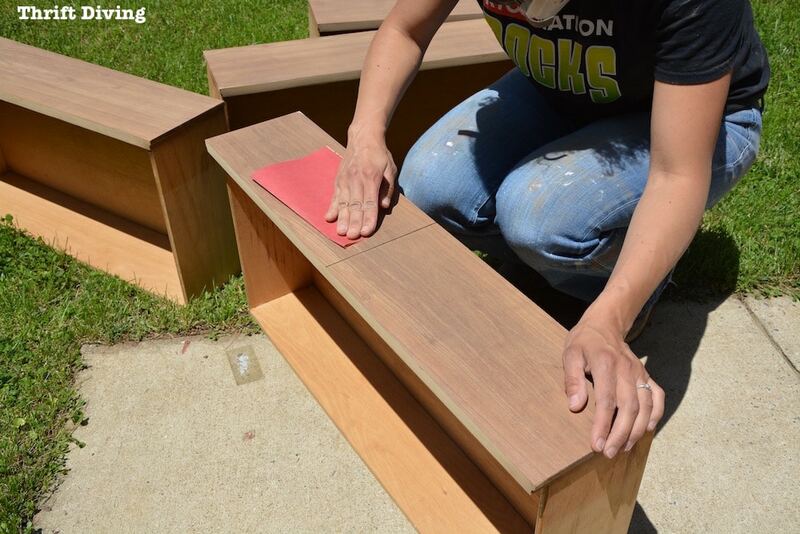 I sanded those down the same way: started with 80-grit…….then used 150-grit……followed by a finer grit. I finished off with a very fine grit by hand to remove any sanding marks. Afterward, it felt like buttah, baby! But the insides were dingy yellow. 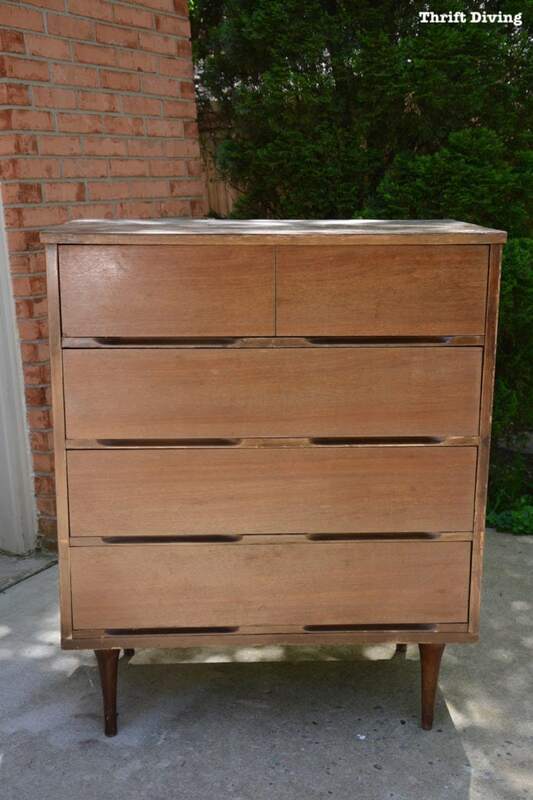 Would you want to put your clothes into some dingy yellow vintage mid-century modern dresser? As cute as it is on the outside……um…..no thanks. But check out how dramatic the difference was! It was total revitalizing, inside and out. It didn’t take any time at all, really. 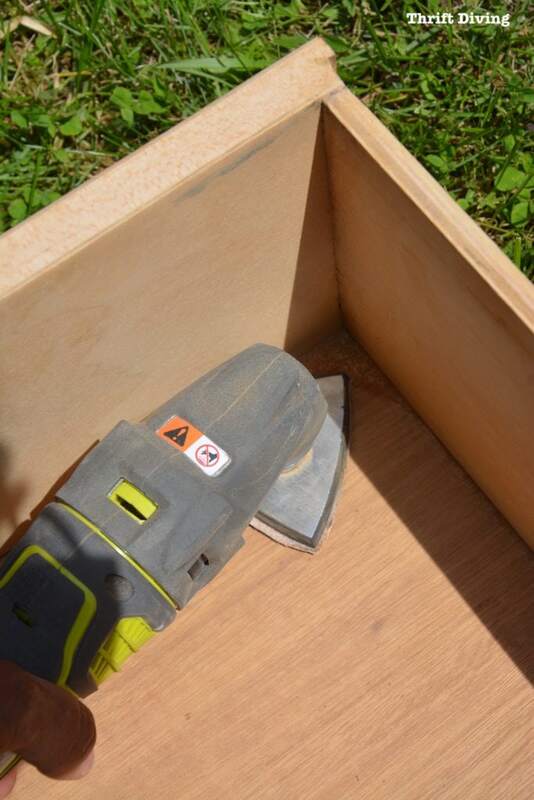 I’d highly recommend trying it for your next project with drawers. Really breathes new life into those ugly interiors of vintage furniture (if you’re not painting the drawers, that is). I used the RYOBI JobPlus multi-tool with the corner attachment to get into the corners where the orbit sander couldn’t reach. 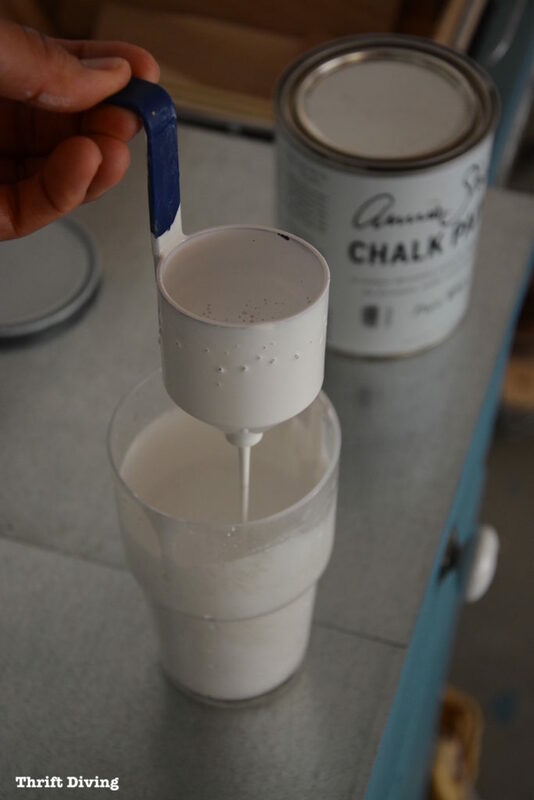 Chalk paint tends to leave brush strokes unless you water it down to get it super smooth (also, depends on the type of brush you use). I decided I would just use my HomeRight Finish Max Pro paint sprayer, which also leaves a smooth finish without brush strokes. When using a paint sprayer, you have to make sure the paint is thin enough to go through the sprayer without getting clogged. So you have to add water and test it the viscosity with the cup that comes with the sprayer. Just watch my video for instructions on how to do it. I used Annie Sloan Pure White for a crisp look. In order to get nice coverage without drips, don’t over-spray. Keep the paint sprayer moving. And definitely add two coats. This was with just 1 coat. The second coat is where the coverage really starts to occur. 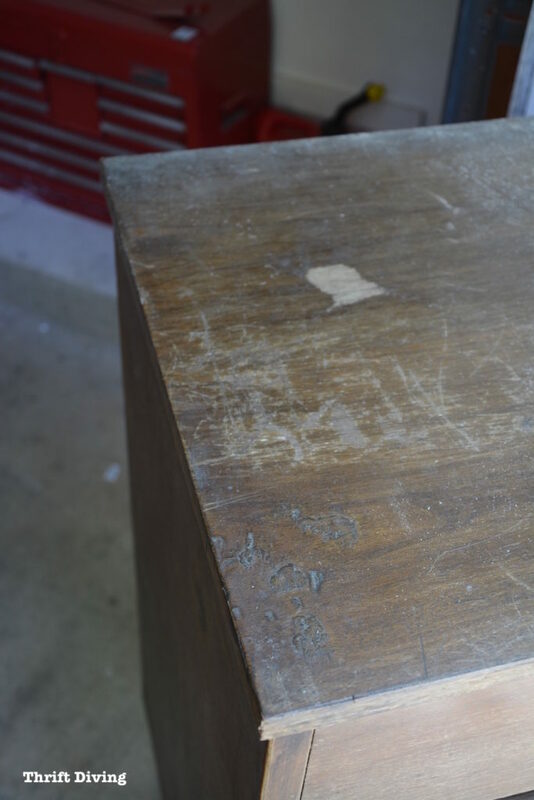 Even though I had sanded the top nicely, it must not have been totally clean. 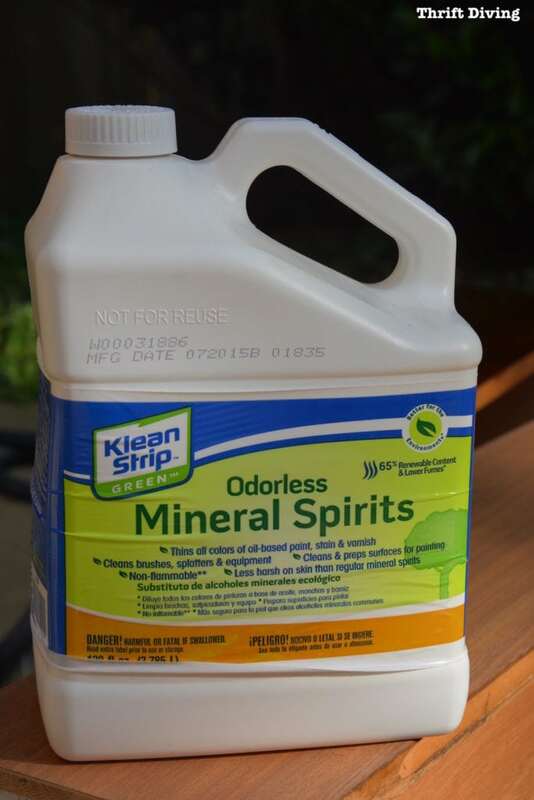 I should have cleaned it with mineral spirits or something, I guess. Because I started getting some staining from the raw wood underneath. I ended up using 2 coats of Annie Sloan…..a coat of Kilz water-based primer (FYI….doesn’t work for crap)……and another coat of Annie Sloan. Lesson learned: Do a test area first to see if you have bleeding. If you do, I would recommend either a coat of clear poly first, a coat of clear wax first, or an oil-based Kilz primer to stop the bleeding before adding the chalk paint on top. It was worth the effort because the white paint looked fabulous! Another thing I needed to do was to add a new back to the dresser. 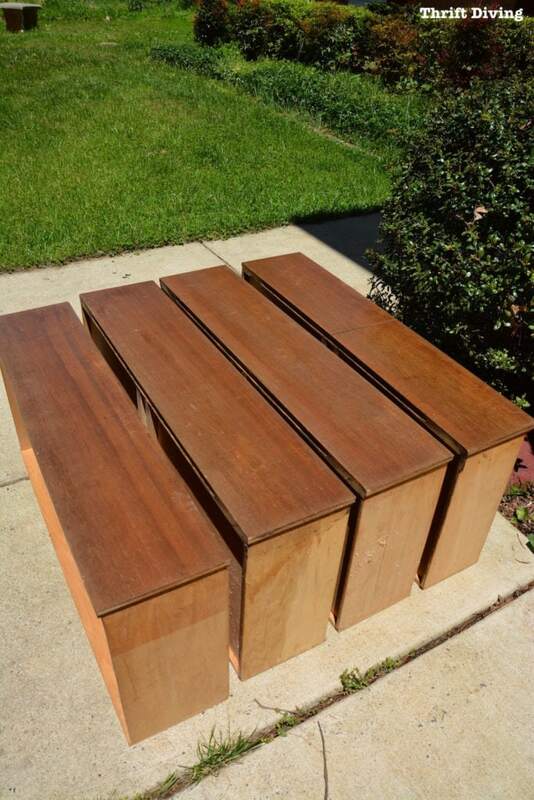 I got some 1/4″ plywood from The Home Depot (total was about $20 for the wood. 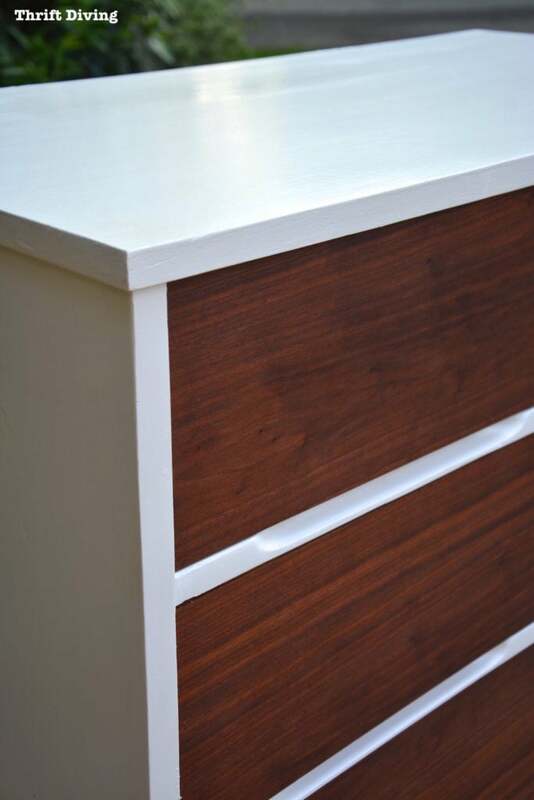 Crazy that the plywood cost more than the dresser!!!!). Then I used my jigsaw to cut pieces for the back. I ended up having to cut two pieces to fit the back. The back got a coat of paint, too. 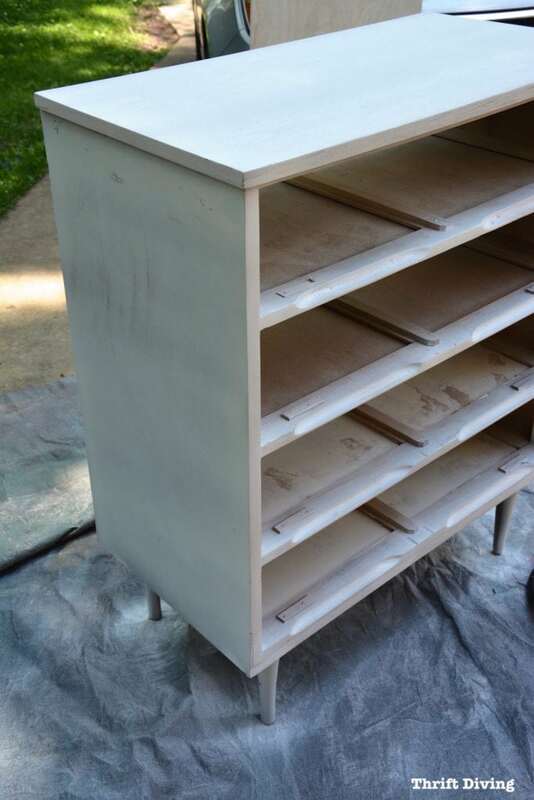 When I started this mid-century modern dresser makeover, I intended to stain the drawers. But after using tung oil on my mid-century modern chair makeover some time ago, I was convinced of its powers to restore wood. I decided to try it this time, too. 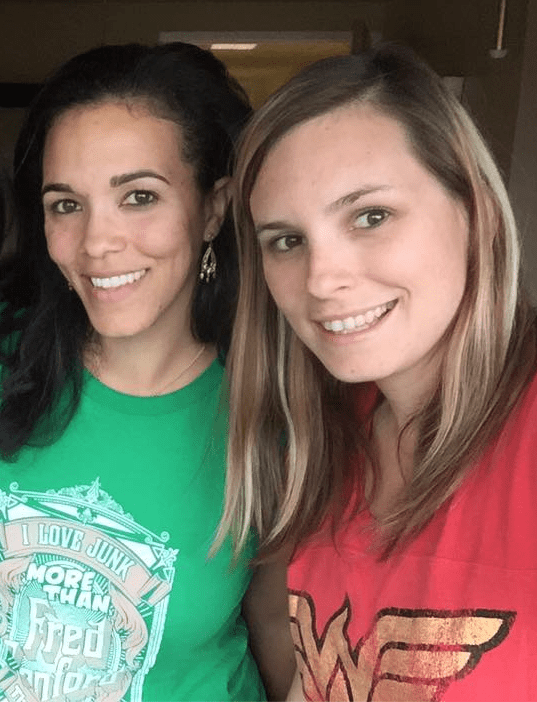 Look how amazing the results are, side-by-side! 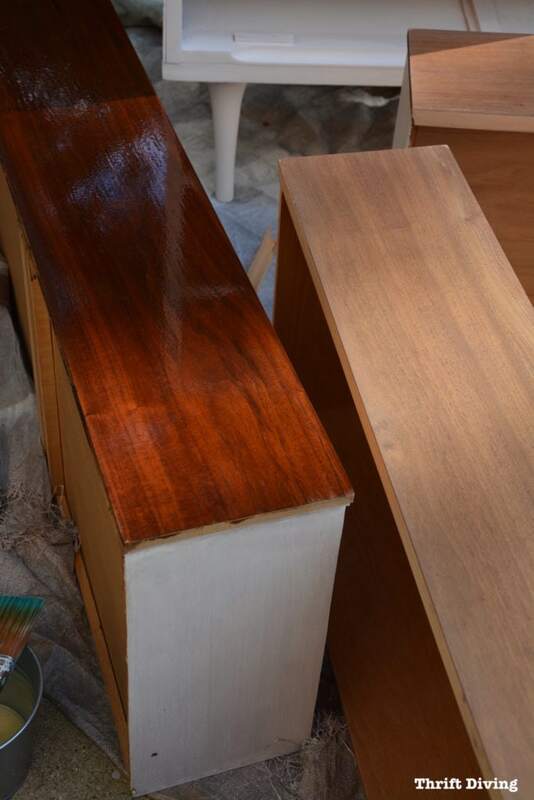 The directions on the tung oil said the first coat should be a 50/50 mix of tung oil and mineral spirits. It said to wipe on and leave for 10-15 minutes, then wipe off. 24 hours later it recommends adding a second coat of tung oil only. 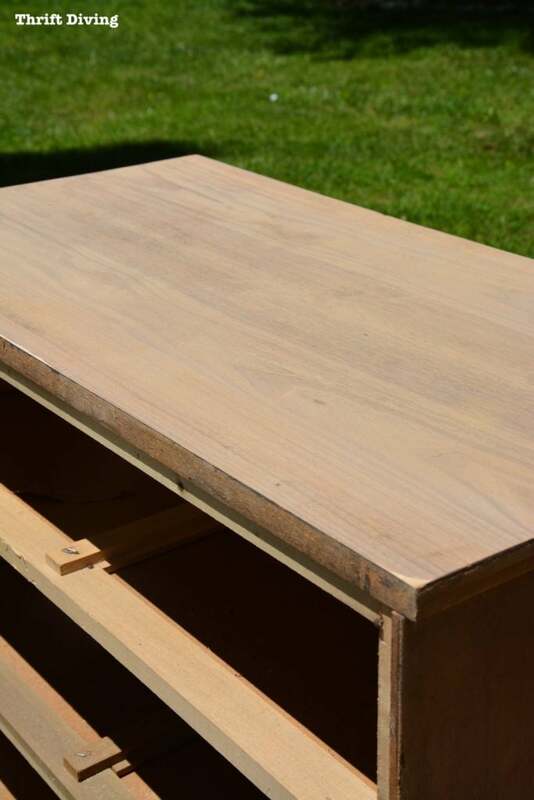 Keep in mind that I did NOT stain this wood….I only used the tung oil mixed with mineral spirits. Since this piece is a mid-century modern piece, I didn’t want to use wax. I wanted something with a bit of shine, but not too much gloss. 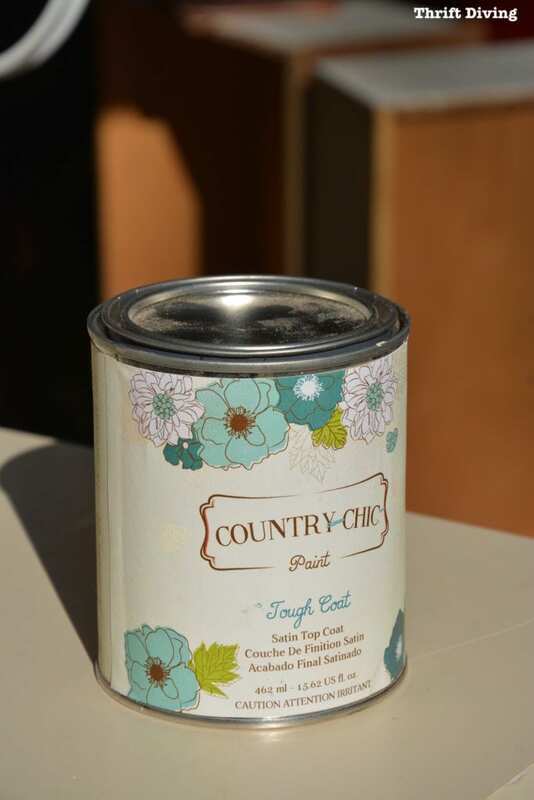 The Country Chic paint people had sent me a sample of this Tough Coat some time ago and I had just gotten around to using it for this project. It left just the right amount of shine, without being too glossy. It was hard to apply with a brush, though. Not because the brand, but because top coats are hard to apply perfectly without skill! I don’t use them often enough to consider myself a DIY ninja with it. I kept going over the same spots, messing up the finish, worried about leaving stroke marks. I would recommend practicing on a scrap piece of wood first before using it on your final project. 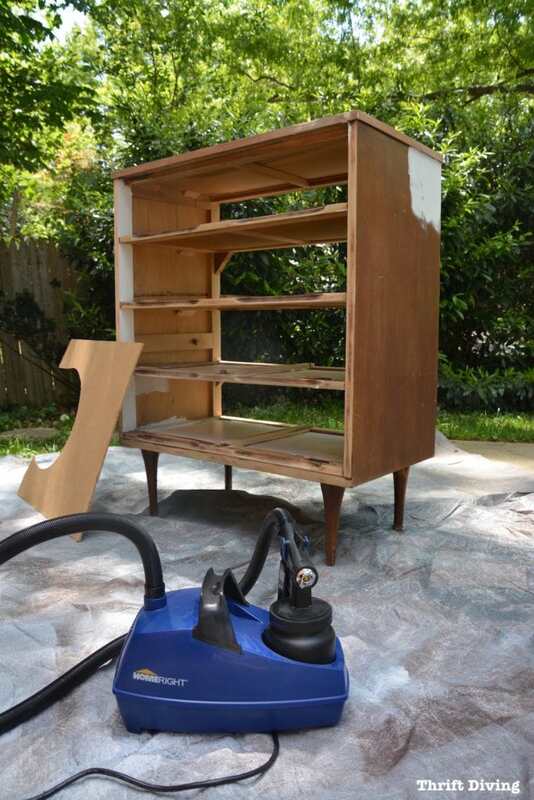 (Or, if you have a lot, use the paint sprayer, which can apply it evenly). The results are pretty dramatic, don’t you think? I mean… what should have been a mid-century modern reject ended up becoming a beauty that even took me a long time to appreciate! Lately I’ve gotten into this “furniture makeover giveaway” mode because I’ve been enjoying working on projects to give to my family than to keep for myself, like my previous furniture makeover of that vintage chair makeover from the nursing home I did for my mom. It’s going to its new home to my cousin, Danielle, who needs a dresser for her son. I’m so thankful that The Salvation Army left behind this awesome dresser! And I’m sorry that I didn’t have the insight into what this dresser could be sooner. But I’m at least thankful that my cousin will be able to enjoy it! Have you ever worked on a project that you later had negative feelings about, but it ended up turning into something you were proud of? If you’ve enjoyed the hard work that went into creating this project and post, do me a favor and share it with your friends and family! I would forever be grateful! Serena that is one beautiful MCM. And I never would have believed it started out like it had one foot in the trash. I am also working on one and it seems to be peeling away, at least one of the side layers. So I will also have to paint much as I don’t want to. 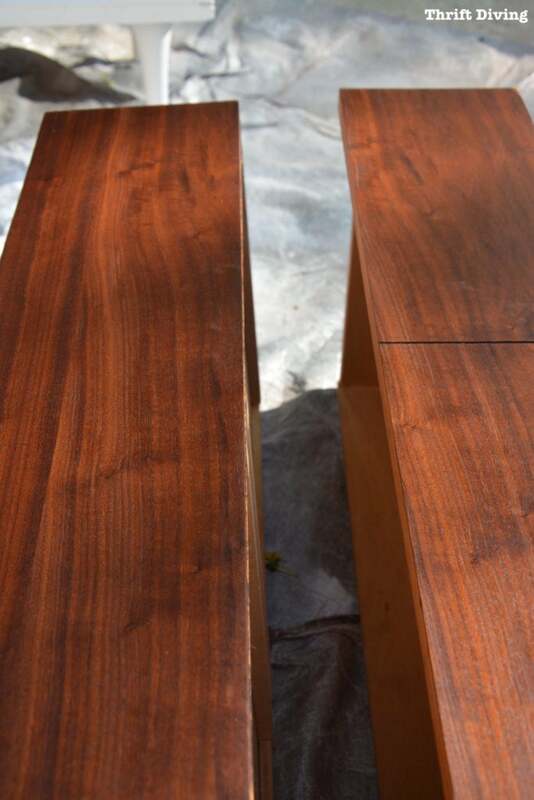 I have also tried Tung Oil and loooove how it instantly brightened up the wood. Your cousin is one lucky lady! Enjoyed your post. I just recently repainted a midcentury piece I picked up for $10!!! 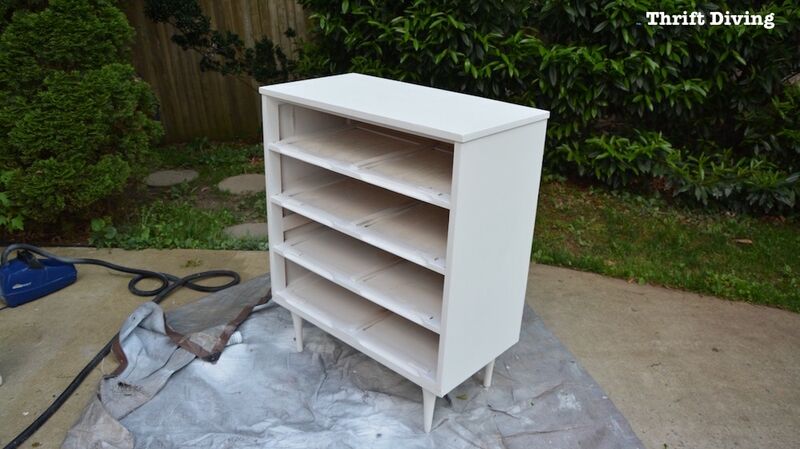 Actually, it was in fairly good shape, so all I did was lightly sand and paint with a primer/paint combo in white. I had to do about 4 coats, but next time I’ll use an oil based primer. I was lazy this time! Nonetheless, it looks great. Not to say it wouldn’t look cute on something not authentic. I’m just disappointed, because when I started reading, I was expecting to see it actually restored, but the ending was a bit of a bummer. Hey there, Michelle! I have come to appreciate wood soooo much in these last few months after building my own DIY bathroom vanity from scratch (I used Red Oak). The cost of the wood, the grain, the effort…and the learning that came along with about the properties of wood, made me appreciate wood much more than I did in the past. 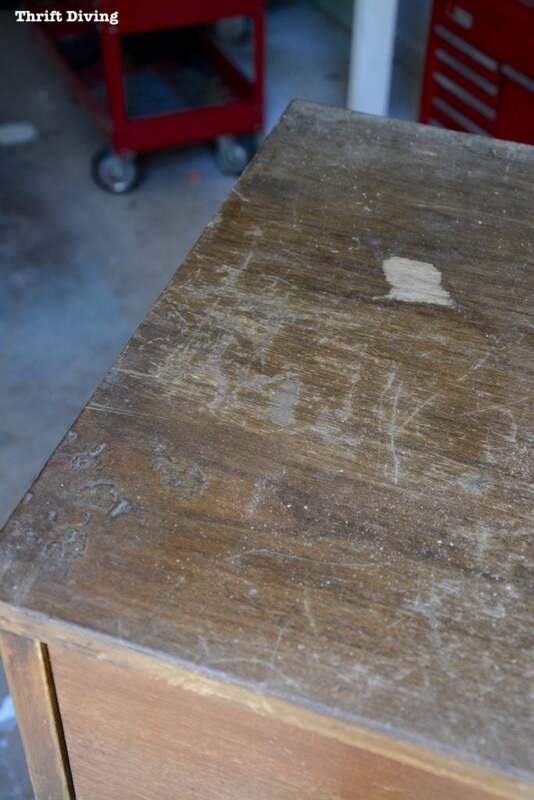 The “sister” dresser of this piece is what I am working on now and I am attempting to restore it with tung oil. OMG…totally didn’t turn out as expected, but still in much better shape and you can see the beautiful grain. With that being said, I don’t frown upon people that want to paint wood. 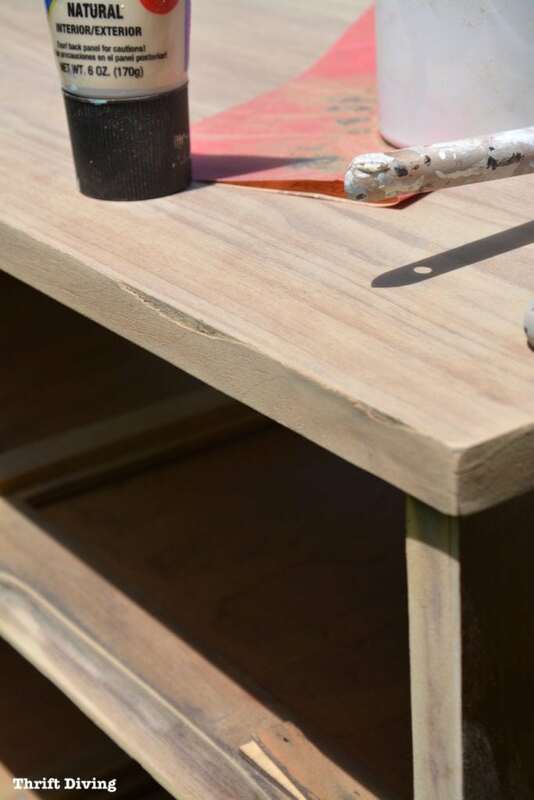 People who are buying used furniture and bringing it into their style, even with paint, and saving something from a landfill or saving the environmental impact of manufacturing new furniture, are doing something great, even if they’re “ruining” the wood. 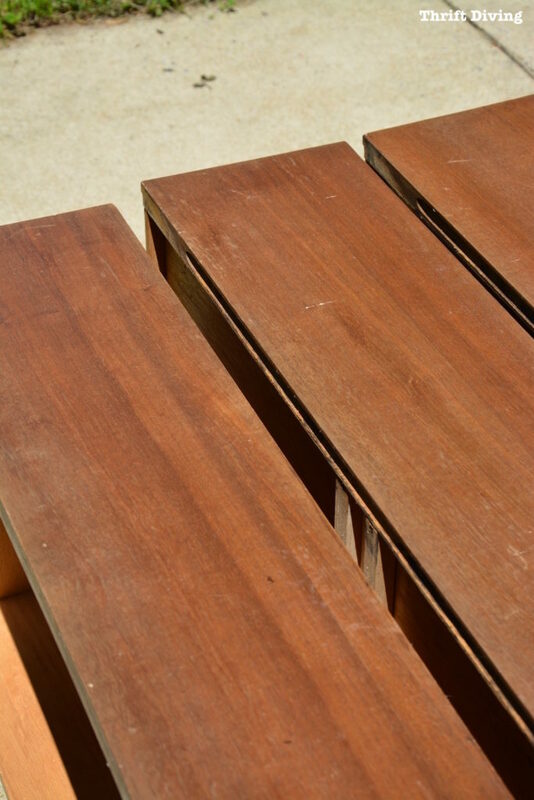 One tip, though, for pieces that may be stripped later, would be for them to apply a coat of shellac to protect the wood before painting in the event they may later want to strip and restore it. To each their own, as long as they’re happy, it makes them feel good creativity, they’re saving money, and flexing their creative muscle. After all, if it’s not an antique that’s worth thousands, it shouldn’t matter if someone wants to paint their wood.